Gareth Edwards deserves more critical acclaim for his visual effects work than his direction in this piece. 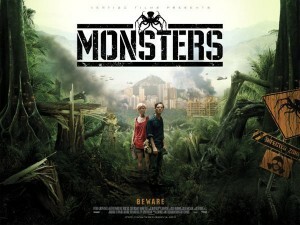 Monsters boasts the kinds of creations that recall the beautiful imagery and craftsmanship of Jurassic Park – remember how stunningly real the billion-year-old creatures seemed back in 1993? Well, in 2010, Gareth Edwards made non-existent creatures palpable. So much so that you could almost feel them in the room, next to you, watching the movie, a credit to the eerie, luscious environment he created as well. Last year, District 9 and Avatar brought us just as lively creatures, but Gareth Edwards did it with only $200,000 (estimated) at his disposal, trespassing all over Mexico, and using locals and “non-face” actors; it’s safe to assume that most of the budget went to the FX department. But, regardless, it’s a feat, and one that deserves recognition. An incredibly simple story, Monsters follows two young adults on their trek from central Mexico across the “Infected Zone” and over a wall into America. An obvious allegory exists regarding the border situation between Mexico and America, in that the wall was built to keep the outsiders from coming in, but what makes the film interesting are the monsters themselves, which are barely even monsters at all. What could be most aptly described as walking and glowing spiders with a dash of jellyfish thrown in the mix, they seem almost dormant throughout the film. We see them only through our peripheral vision and on the nightly news in grainy images. Think Bigfoot. But once we’re shown the creature in its full and majestic glory, the message of the film becomes quite unclear. Are they monsters, or are they just misunderstood? Random tickers on the news tell us that the aliens come from Europa, a moon on the outside of Jupiter. It’s a moon that apparently is on the shortlist for “most inhabitable,” and was probed by NASA six years ago. Upon the probe’s return, it crash-landed in Mexico and brought back these monstrous passengers. We’ve been fighting them by all available means ever since: ground attacks, Air Force strikes, and by sea. Is it fear of the unknown that prompts these attacks? Propaganda fed to a fearful continent? Or are these creatures really a danger? The film seeks to answer none of these questions. It’s almost a subplot, until the answer is inferred during the film’s final ten minutes or so. Using the locals and the unrecognizable actors, it’s easier for a random audience to sink into the film and be swept away by the breathtaking visuals and the sweetly simple story. A few holes are to be noted, upon introduction to the basic plot – a father sends a worker-bee photographer, Andrew (Scoot McNairy), already stationed in Mexico, to retrieve his vacationing daughter, Samantha (Whitney Able), and bring her safely home. Why couldn’t the father go? Well, who knows? But the story works. I don’t think we’re allowed to call an alien invasion film unbelievable. They travel up river through the Infected Zone to get to the American border. You could make a comparison about the river in Apocalypse Now (1979), but I think that might be stretching it. Whereas the river in that film subtly mirrors its lead character’s life and tribulation, here it’s kind of spelled out; so not really a parallel, but more of a brief allusion. 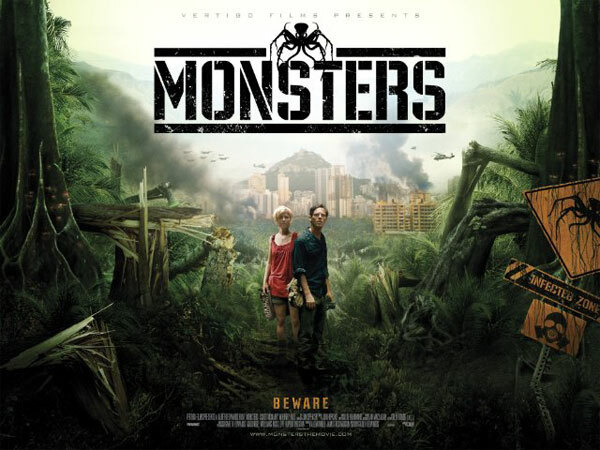 Monsters has the awkward feel of a first feature, even though Edwards has been behind the camera before on television, but that doesn’t stop the film from succeeding. What’s not quite right in front of us is washed by his promise as a filmmaker. Consider early M. Night Shyamalan, who many other critics think would appreciate the film’s pace and structure. There are a few small pacing problems within the structure of the relationship built between the two leads, and a lot of expository dialogue that isn’t needed, but by the end of the film, due to its understated, elegant, and heart-stopping ending, we’re left with a myriad of questions: What exactly is a monster? What is beauty? And who decides?